Cramer & Anderson Founding Partner Henry B. (Hank) Anderson. One of Cramer & Anderson’s founding partners, Henry B. (Hank) Anderson, has won a Lifetime Achievement Award as part of the Connecticut Law Tribune’s 2018 Professional Excellence awards. Cramer & Anderson won four awards this year, and the honorees will be recognized at a May 24 awards dinner at the Bond Ballroom in Hartford. 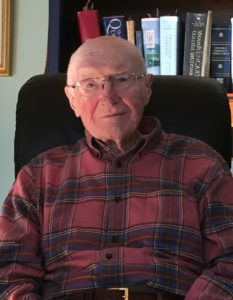 The award for Mr. Anderson, who is retired and living on Cape Cod, was based on a nomination letter submitted by Partner Robert L. Fisher, Jr.
Cramer & Anderson Founding Partner Henry (Hank) B. Anderson turns 100 on May 30, and his life has been as distinguished as his 50-year legal career in Connecticut. The son of a dentist, Anderson completed his undergraduate degree at Wesleyan University in 1940 and joined the Navy in 1941 as World War II intensified. He survived kamikaze attacks on two aircraft carriers in the same week. “Hank is a living example of what Tom Brokaw called ‘The Greatest Generation,’” said Partner D. Randall DiBella. On the same day in June 1948, Anderson received his law degree from the University of Connecticut School of Law in Storrs, and then travelled to Middletown to receive a master’s degree at Wesleyan. 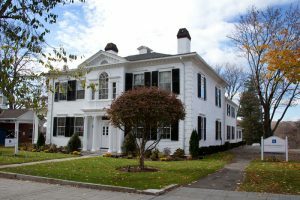 Anderson found a home as an attorney in western Connecticut in the 1950s. His small firm Anderson and Altermatt merged on Jan. 1, 1962, with Cramer, Blick, Fitzgerald and Hume to become Cramer & Anderson. He retired December 31, 1998, and lives now on Cape Cod with his wife, Bunny. In the town of Sherman, where Anderson lived for many years, he was Judge of Probate. (He also served on the Executive Committee of the Connecticut Probate Assembly.) As a trial justice he presided over the local Justice of the Peace court. He was the first town counsel for Sherman and held the post for approximately 25 years. In addition to the Lifetime Achievement Award for Mr. Anderson, Partner Randy DiBella has been named one of the Best Mentors among Connecticut attorneys, Partner Daniel E. Casagrande won the Giant Slayer award, and Attorney Christopher Sochacki won a Distinguished Leaders award. The Connecticut Law Tribune announced the honors March 23 as part of its annual statewide Professional Excellence Awards. Cramer & Anderson has offices in New Milford, Danbury, Ridgefield, Litchfield, Kent, and Washington Depot. For more information, see the website at crameranderson.com or call the New Milford office at (860) 355-2631.